Sam and Kate run a small, independent food van, at the beach of Kingsbarns, Fife. They bought the vehicle as a generic, white burger van, and from there, completely ripped it back, and built it up to be their own. 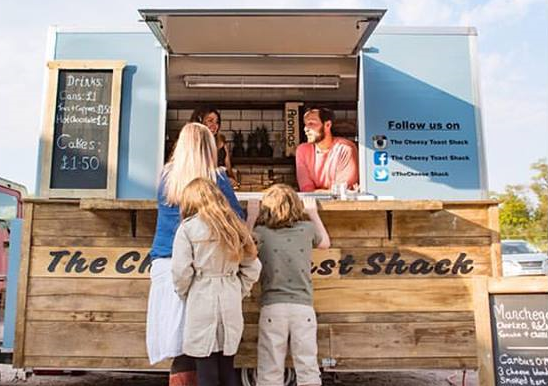 The Cheesy Toast Shack has been designed by them, as nature lovers, to look and to feel as organic and natural as possible, using material such as wood, and neutral tones, in order to reflect and to fit in with everything they love about the area they call home. Sam & Kate got in touch to tell us about their ideal day in the Kingdom of Fife. "A perfect day for us in Fife, would be to wake up in our home, next to the River Eden, where we’d sit with our morning coffee on the bench outside the front. Here, I may catch up on my emails, whether it be arranging deliveries of our Scottish cheeses, or organising logistics of possible events and farmers markets we have coming up. Depending on conditions, Sam may take a stroll down the river, and have a few casts whilst sitting on the riverbanks. Sometimes he manages to come back with a decent sized Brown Trout for our dinner, but mainly he goes for the peace and quiet of it all. After I’ve finished all of my computer-based jobs, and Sam has returned, we get in the car and drive across to Kinshaldy Beach, Tentsmuir. We often park the car in the clearing, and take a wander down through the woods to the old Ice House; about a 30-minute walk. From here, we walk down to the beach, where, if you’re lucky you can see the resident seal colony basking in the sunshine. We’d then walk back towards the car, following the sand dunes. It’s always a good extra bit of exercise for us – clambering up and down the banks, the sand shifting beneath our feet. By the time we’ve made it back to the clearing, it’s always a welcome sight to see Ben and Margaux; owners of The Crepe Shack, waiting to take our order. Margaux is French, which certainly helps with the two of them managing to make authentic tasting crepes in their mobile crepery. They proudly use Scottish produce to create great tasting, delicious crepes, with options of both sweet and savoury. My personal favourite is their honey, banana and oats option. After refuelling on crepes, we may then take a drive along the coastal road to the beach at Kingsbarns. That may sound silly, as that’s the place where we work; however, we love visiting, even on our days off. Kingsbarns is a hidden gem for us. It’s not half as busy as the beach at St. Andrews (East Sands) and on days where the swell is good and the winds are blowing in the right direction, we can get in for a surf. When we’ve had our fill of enjoying the beautiful clear waters and the golden white sands, we get back in the car to St Andrews, where we frequent our favourite pub; The Central for a quick pint. Weather permitting, we choose this place due to it being the perfect sun catcher for the last few rays of the day; sitting outside on the chairs lining the pavement, watching the world go by, whether it be the hoards of students enjoying a few pints in between studies, or the tourists having visited for the golf, still clad in their plus fours and matching flat caps, after a long day of teeing off on some of the world’s most famous courses. By the time we’ve done all this, it’s generally time to head home, as the sun is starting to set and the air getting slightly cooler. If the night is chilly, we go back to light our open fireplace, with wood purchased from a local friend’s farm, where we enjoy a glass of wine before getting an early night, ready for the next day ahead of us. For the laidback lifestyle that we have grown to love, Fife has everything we need. From coastline walks, to beautiful scenery, and most importantly, amazing local food and drink, we couldn’t think of anywhere else we’d rather call home."